The SpreadSheet widget has a very rich UI structure. This guide is intended for providing you with useful tips on customizing the default user interface according to your needs and requirements. The SpreadSheet toolbar contains blocks of buttons grouped according to their functionality. The arrangement of buttons blocks in the toolbar is specified in the "buttons" collection. The Toolbar's specificity is that it can include only one row of buttons. However, there is also a way to customize the Toolbar so that it would have a multi-row structure. In this case the "toolbar" collection should be used. Let's consider the structure of both the buttons collection and the toolbar one in detail. It contains a hash of data, where the key is the name of a block of buttons and the value is an array of buttons' names. You can add a new block with the necessary name or without any name. In the latter case the block name should start with the “$” sign. You can specify the title of the buttons block in the Spreadsheet locale. To define a preset button in the toolbar, you need to use just its name. You can also add a custom button: a text button, an icon button, a selector, etc. If you want to show too many buttons and their number exceeds the Toolbar's width, you can group them. For this purpose, add an icon button and attach a popup to it. This popup will contain all buttons of the group. A popup can be attached to a button with the help of the popup property. 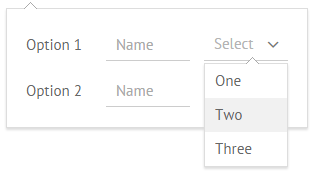 You need just to set this property in the button's configuration. The “ssheet-icons” is a Dataview-based view. 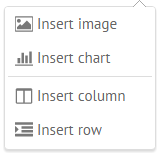 So, you can set the layout for icons using the xCount and yCount properties of DataView. 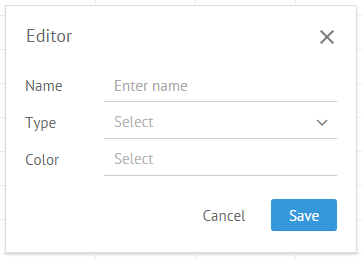 You can also create a form popup and attach it to a Spreadsheet button. Form controls in a SpreadSheet dialog follow the same rules as popup controls do. We recommend to use the "ssheet-dialog" view to create a dialog instead of the window one. The "ssheet-dialog" view applies styling for the header and adds three buttons: the Close icon at the top and two buttons (Cancel and Save) at the bottom. To define the title of the dialog, use the head property. The background of this icon is defined by the “webix_ssheet_hide_icon” CSS. The dialog fires the following events on a button click: onCancelClick and onSaveClick. Besides form controls you can add any views into the dialog, e.g. a datatable. In this case we recommend you to choose the "ssheet-dialog-table" view to apply the appropriate styling. Let's suppose that you've got a large set of buttons you want to place on the Toolbar and additional buttons with popups are not enough. You may also want to build your own powerful spreadsheet and go beyond the possibilities of the default SpreadSheet configuration. To help you implement all your best ideas, we added the possibility to create a custom Toolbar. Unlike the default configuration, a custom toolbar is defined through the "toolbar" collection and allows specifying the width and height of buttons, setting margins and paddings and set separators between the blocks of buttons. Pay attention that buttons in the "toolbar" collection should follow the same rules as in the "buttons" collection. The full code for all toolbar elements is given in a separate article.